It was a disappointing homecoming for Red Bull Racing as they failed to make the podium for the first time in six races at the British Grand Prix on Sunday. In the final of the first ever triple-header of races, the Tilbrook-based Bulls struggled to match the pace of championship front runners Mercedes and Ferrari, with Daniel Ricciardo coming home fifth, while Austrian Grand Prix winner Max Verstappen retired in the latter stages. Low on top-speed around the notoriously rapid Silverstone circuit, the RB14 was trapped in the middle between the pace-setters and the remainder of the grid during qualifying, but a tangle at the first corner between home-crowd favourite Lewis Hamilton and Ferrari's Kimi Raikkonen promoted Verstappen to third in the early running, with Ricciardo behind in fifth. With Raikkonen handed a 10-second penalty for his misdemeanour with Hamilton, it promoted Ricciardo above him when he pitted early to take his penalty and change tyres. Ricciardo held off the tentative threat from Raikkonen not long after the Finn emerged from the pits, but two quick safety car periods would once again shake up the field. As Hamilton battled back through the field having been last on the opening lap, he was up in third but he nor team-mate Valtteri Bottas did not stop for new tyres where the Red Bulls and Ferraris did. While Bottas relinquished the lead to Sebastian Vettel, who went on to take his second British Grand Prix triumph, both Bulls fell behind Raikkonen before a spin for Verstappen prompted his retirement, and Ricciardo took an anonymous fifth. “We just didn’t have the legs today," said the Australian. "The first lap was fun and a bit crazy for sure, I don’t know what happened to Lewis but I saw he was turned around. Then with Max and Kimi we had some good battles. "The re-starts were intense but we just didn’t have the speed on the straights to do much and behind Ferrari and Mercedes we were just too slow. I think the car in clear air was pretty good, particularly in the second stint on the medium tyre when we were able to pull away from Kimi a bit and then start catching Max. "The team then pulled the trigger on a two stop strategy for me and then the safety car came out. We just got unlucky and lost track position. We tried at the end to pass Bottas as he was struggling more with the tyres but as soon as I got really close to him I felt like my tyres were the same age as his, you just lose the downforce and really struggle. It was a bit like last week following Kimi and I really needed him to make a mistake, otherwise on the straights, even with DRS they have a lot more power. "I guess since Monaco we haven’t really had things going our way." 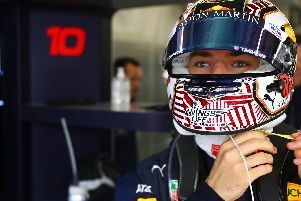 Verstappen added: "It was quite weird, because on lap one I had a brake-by-wire issue, the pedal fell to the floor in Turn 3 but then it recovered and everything was going fine after that. Then after the second safety car I braked for Turn 16 and the pedal literally went to the floor, the rear brakes locked up and I spun off the track. We will now start to investigate what actually happened. "Even without the brake issue we were just too slow on the straights to do anything today, you could see it even with Daniel when he was attacking Bottas; when we open the DRS we are the same speed as them without DRS, so you just cannot do anything. "I think so far this season I have actually been okay with the reliability of our car, so it’s just a shame that it happened here. When you know you have a difficult weekend, you of course want to take some points back home."